First, most textbook suggested vocabulary lists include way too many prepositions. Take a deep breathe, remember that you can’t control vocabulary, resist the pressure to cover too much content, and determine to deeply practice a few at a time, because you’re truly interested in long-term memory. Second, prepositions that indicate location (above, behind, on top of, below, next to, between) are a highly visual concept. Remember that vision is the sense that trumps all the rest and find ways to give students visual practice with these. This picture is titled “Barbacoa en Yaco Sistemas” and was taken in Andalucía, Spain. I chose a photo that was culturally authentic, but that also complicates how much students will recognize in the photo. You can use a photo you took yourself, or find one on Creative Commons. You can choose one from the target culture, or something random. You can choose one that illustrates some topic from your current unit, or a previous unit (think: school supplies on a table, animals in a pen). The sweet spot here, in my opinion, is a photo from the target culture illustrating a topic covered many weeks before, to effectively recycle material students may be forgetting, and including mostly items that students know the words for. 2. Set up the noun vocabulary. Next, in the target language identify with students what you see in the photo. Perhaps you know what all these foods are. Perhaps you don’t. 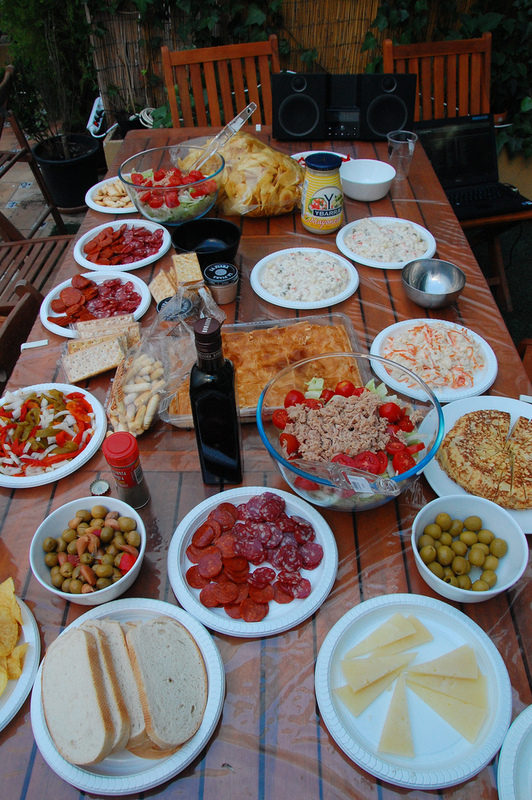 Let’s see what we have here- looks like salad, chips, sausage, crackers, olives, bread, cheese, oil, pepper, bowls, glass. What else? I see a food that makes me sick. It’s next to the salad. It’s behind the cheese. It’s also behind the bread. It’s next to the sausage. It’s in front of the pepper. Try this out as a class starter that takes advantage of the high brain activity at the beginning of class, or as a brain break when you can tell students are nearing or at the end of their natural attention span.